(IPS) – Thousands of people in the northwest Argentine province of La Rioja are mobilising to stop an open-cast gold mining project in the Nevados de Famatina, a snowy peak that is the semi-arid area’s sole source of drinking water. La Rioja “is a dry province and we have just enough clean water to live on, but not to share with miners,” one of the protesters, Héctor Artuso, a resident from the small town of Villa Pituil, in the Famatina area, told IPS. Residents of Famatina and neighbouring Chilecito have set up a partial roadblock at Alto Carrizal, a stop located 4,000 metres above sea level on a gravel road leading up to the highest point of this mountain chain, Cerro General Belgrano (better known as Nevados de Famatina), which stands at 6,250 metres. Still visible in Famatima as historical reminders of nineteenth- century mining activities is the abandoned mining site “La Mejicana”, which includes a tramway system built by a British company in 1905 to transport gold and other metal extracted for export. Back then mining was done in underground pits. Today, modern mining methods require large explosions, huge volumes of water, and the use of cyanide to extract the mineral, which is why local residents are protesting. The activists maintain the Alto Carrizal roadblock day and night, but are selective in whose passage they block. 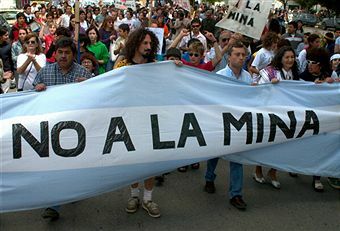 Local residents and tourists are allowed through, while provincial authorities are stopped, along with anyone representing the Canadian company authorised by the Argentine government to mine the area. Protesters are backed by a number of national and international environmental NGOs, including Fundación Ambiente y Recursos Naturales, Greenpeace, and Los Verdes, which in recent days voiced their concern about the activists’ safety, reporting threats and harassment. Political parties from the opposition and celebrities are also stepping forward to support the anti-mining campaign. The conflict was sparked in October 2011, when local residents learned that the La Rioja state-owned mining and energy company Energía y Minerales Sociedad del Estado (EMSE) had signed an agreement with the Quebec-based Osisko Mining Corporation, to mine Nevados de Famatina. The agreement was never made public, and the government failed to hold the public hearings and perform the environmental impact studies stipulated under the 2002 General Environmental Act. Even Famatina authorities were left out of the agreement. Mayor Ismael Bordagaray, in fact, supports the demonstrations against the mining project. “I’m doing it basically because I have to stand by my community and this is what the majority of the community wants,” he told IPS. But the mayor said he was also concerned as a citizen. “I have the same fears and misgivings about the risks of pollution, indiscriminate use of water, and lack of controls that come with this kind of project,” he said. Bordagaray also said he had read the agreement, which he found very vague, and does not know why it has not been made available to the public. It was Osisko that gave him a copy, and not the provincial government, which is headed by Bordagaray’ own political group, the Frente para la Victoria, the majority faction of the centre-left Justicialist Party of President Cristina Fernández. La Rioja Governor Jorge Beder Herrera’s position on mining has shifted since coming into office. During his 2011 campaign he had spoken against it, but after the election he announced the agreement signed with the mining corporation. Now, despite overwhelming opposition, EMSE Director Héctor Durán Sabas declared that they will be going ahead with the project “because it’s a state decision and a matter of public policy”. In Argentina, provinces have jurisdiction over their natural resources, and the national government’s regulatory role is limited to setting basic guidelines on which each province then bases its own specific legislation. “Our community is fully aware (of what the project entails) because we’ve been through this before,” he said, recalling how in 2006 the local population succeeded in stopping a similar project by another Canadian mining company, Barrick Gold Corporation, and later a Chinese venture. Many people who are participating in the current demonstrations were also involved in the anti-mining rallies, marches and roadblocks that began in 2006, and the reasons are the same: the fear their water will be polluted. However, there are also groups that have been won over by the mining companies and claim they support the project. “The worst problem is the social contamination these projects generate, because they create deep rifts in these small communities,” Artuso said. According to Artuso, while a great deal needs to be improved in terms of production in this part of La Rioja, the region has excellent vineyards and produces world-class wines for export, as well as “the country’s finest nuts”, and olives, peaches, apricots, plums, figs, and quinces. “We also have enormous untapped potential for mountain tourism, which is an activity that is sustainable in the long-term, unlike mining, which will be here 10 or 20 years, contaminating, and then it will be gone,” he said. In addition to blocking the road and garnering support across the country – with marches and rallies held in eight other provinces and Buenos Aires – on Jan. 16, the protesters organised a large caravan from the city of Famatina to the site of the roadblock. Some 6,400 people live in Famatina and Monday’s demonstration attracted more than 4,000 people from the district and from Chilecito, which is also sourced by water from the glaciers and the mountain’s eternal snows. Carina Díaz Moreno, a teacher from Famatina who has two pending lawsuits against her for opposing the large mining projects in her province, spoke to IPS on the phone, as she came off the night shift at the Alto Carrizal roadblock. “We take turns, and we’re going to hold our ground until the government and the company drop this project,” she said. Díaz is one of the people singled out as a leading activist by the company, according to a list found by chance in a folder left behind by company officers and government officials after hastily leaving a meeting in a public building. When a local resident started spreading the word that a meeting was underway, Father Omar Quintero, a Catholic priest who supports the protest, rang the church bells in the Famatina parish, attracting some 200 people who gathered spontaneously to voice their disapproval. “We started chanting slogans like ‘Hands off Famatina’ and they had to wrap up the meeting quickly. In their rush to leave they forgot a folder, which is where we found the list,” Díaz said. The list contains the names and personal information of several activists, and next to each name is a phrase describing what the company claims they are after: “economic compensation”, “fame” or “a government position”. “We know there’s gold in Famatina, and rare earth and other minerals, but we’ve made our decision. We’re not lifting the roadblock; they’ll have to clear us out of Alto Carrizal by force,” Luján said. When Arizona’s State Bill 1090 was being written, Hashimoto said immigrant rights activists in Arizona warned groups elsewhere that it was just the beginning. Since then, numerous other states have passed their own anti-immigrant legislation, some more draconian than the Arizona version.